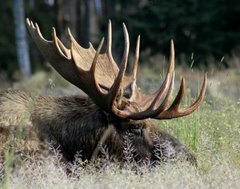 Moose Tracks: Climate "Surprise", Geothermal Heats Glaciers! The "settled scientist" has to live either a life of only looking at computer model data in a darkened room, or be forced to face a number of "surprises". So the shock when they discover that geothermal heat melts ice! Who would have imagined it! ? The life of "settled science" one of "strange happenings" -- when you KNOW that the planet is heating, you can be forced into a situation of "no explanation" for why sea ice would be expanding from already record (in very short history, like < 100 years) levels. I mean, they KNOW that the temps are rising, so it is indeed a complete mystery as to why more ice is being created! When your hypothesis/theory becomes an article of "settled religions faith", data which fails to fit your hypothesis/theory can't be explained! Thus proving that whatever man holds to be his "highest good" becomes "religion" -- of which, "science" is a very poor compared to Christianity.